In this book, readers with no previous study in the field are introduced to the basics of model theory, proof theory, and computability theory. The text is designed to be used either in an upper division undergraduate classroom, or for self study. We give a theoretical and applicable framework for dealing with real-world phenomena. Joining pointwise and pointfree notions in BISH, natural topology gives a faithful idea of important concepts and results in intuitionism. This book is intended for computer scientists and it assumes only some basic mathematical notions like relations and orderings. The aim was to create an interactive script where logics can be experienced by interaction and experimentation. Sets out the basic theory of normal modal and temporal propositional logics, applies this theory to logics of discrete, dense, and continuous time, to the temporal logic of henceforth, next, and until, and to the dynamic logic of regular programs. An examination of the role of partial information - with illustrations drawn from different branches of Intensional Logic - and various influences stemming from current theories of the semantics of natural language, involving generalized quantifiers. Contents: Summary; Translations in Function Logic; Derivations in Function Logic; Translations in Identity Logic; Extra Material on Identity Logic; Derivations in Identity Logic; Translations in Description Logic; Derivations in Description Logic. Mathematical Logic is a necessary preliminary to logical Mathematics. The present work is concerned with the 'calculus ratiocinator' aspect, and shows, in an admirably succinct form, the beauty of the calculus of logic regarded as an algebra. An undergraduate college level textbook covering first order predicate logic with identity but omitting metalogical proofs. The first rules of formal logic were written over 2300 years ago by Aristotle and are still vital. 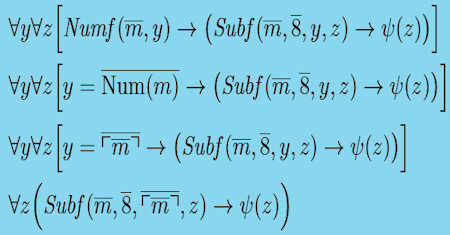 This is Robert Herrmann's elementary book in mathematical logic that includes all basic material in the predicate and propositional calculus presented in a unique manner. Neither proof requires specialized mathematical procedures. An introduction to sentential logic and first-order predicate logic with identity, logical systems that influenced twentieth-century analytic philosophy. The book should help students understand quantified expressions in their philosophical reading.